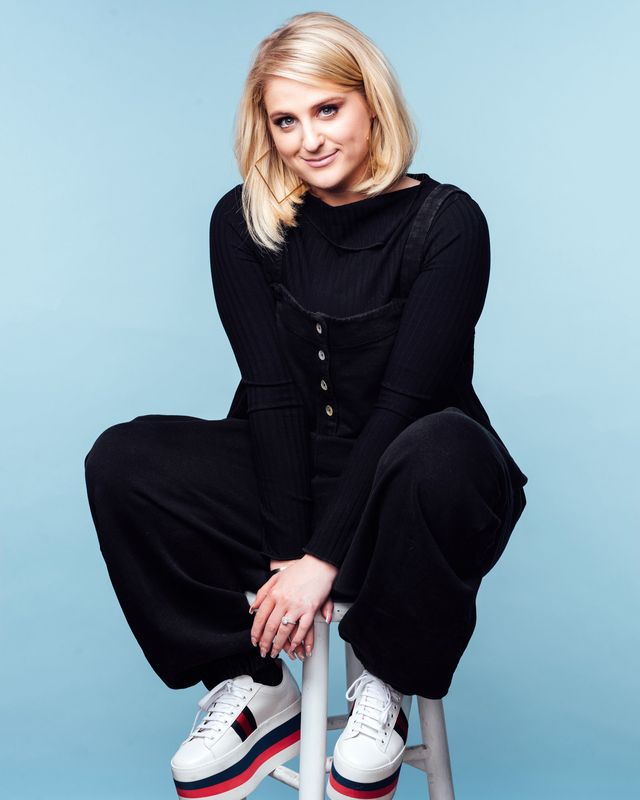 It's been a few years since she's gifted us with pop hits like "All About That Bass" and "No" — but now Meghan Trainor is back with a brand new single, "No Excuses," and a new album that she promises is full of even more pop anthems. 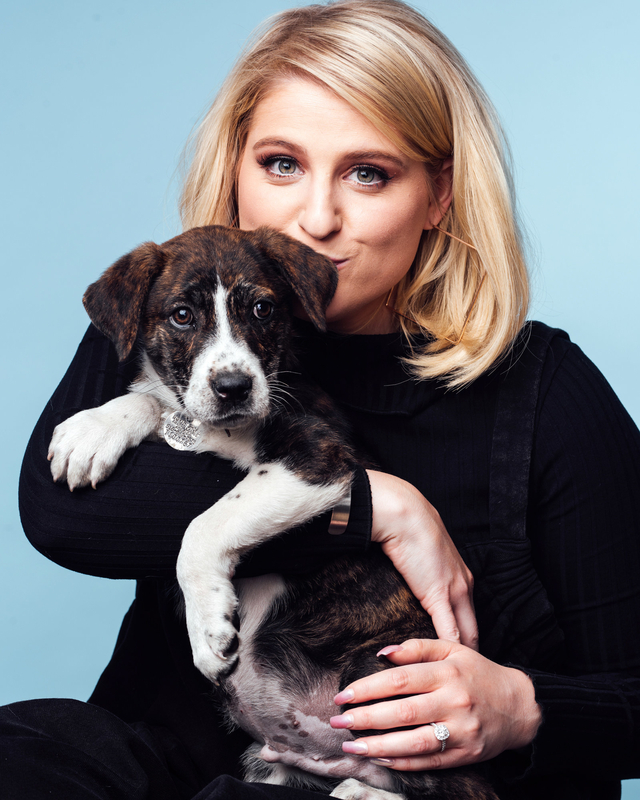 In celebration of her new music, Meghan stopped by BuzzFeed New York to answer everything you've always wanted to know while hanging out with some seriously cute rescue pups. Here's what we learned. What’s the biggest thing you’ve splurged on since you became famous? Meghan Trainor: I bought a Tesla! I did it. I just did that for myself. Yes, I did. Did you grow up watching your fiancé in Spy Kids like the rest of us did? MT: Of course I did! The first time I ever met him was at a party two years before our first date, a songwriting party I was at. And I went right up to him, and I’ve never done that to like a celebrity before, and was like, “Excuse me, are you Spy Kid?” And he was like, “Yeah!” And I would yell — check this out guys — “Spy Kids!” And he would yell, “Meghan!” And I was like, he remembered my name! So I had my whole fangirl moment. And sometimes I told him when we were dating, in the early days, that sometimes when he laughed I would see Juni, little young Juni Cortez [laughs] and I had to get over that. And now I see a man, a very handsome man, that I love very much! Which music video of yours is your all-time favorite? Are there any that you would change now, if you could? MT: I would say my favorite is "No Excuses" right now, because we worked really hard on that one, and there’s a lot of mes and I got to be triplets. And which I would change, I don’t know — “Bass”, yeah, even though that was a big video, I feel like, I didn’t have a makeup squad at the time and I was very new to everything and I didn’t say a lot of what I wanted. And I would’ve changed, I think, some looks up. But they were so famous and iconic that it worked out well. What’s the most ridiculous rumor you’ve ever heard about yourself? MT: That I died. Got a lot of those, got a lot of “I’m pregnant” and “I’m dead.” So, I’m good, I’m healthy, I’m alive. I sent the “passing of our sweet, beloved Meghan Trainor” sent that article to my mom and she was like, “This is not even funny, do not send me this.” So...don’t say that, if I’m alive. What was your inspiration behind your new single, “No Excuses”? MT: I wanted to write a big anthem for my way back, and I wanted it to mean something, and I’ve had personal experiences with respect and people respecting each other of all ages. So I wanted to write a fun, happy song! That was like, a modern day version of R-E-S-P-E-C-T, respect me, you know? There’s no excuse. Treat others the way you want to be treated. Like puppies. What was your favorite memory while writing this album? MT: My favorite memory while writing this album is having my family singing on backgrounds and trying to record them and not make a mess. Can you give us a hint as to what the rest of the album will be like, and the inspiration behind some of the songs? MT: The rest of the album’s gonna be pop! Pop anthems. A lot about love, a lot about happiness, and songs about loving yourself. Every song is like a dance song except one, there’s a beautiful ballad in there. And the inspiration was my life, and experiences that I go through. Who has been the most inspiring to you during the creation of your new album? MT: I listened to a lot of ABBA before this, and OG pop. Like young Britney Spears, like, she’s so lucky, bum, bum, bum! Listened to that a lot, loved how the backgrounds are in there and love the vocalists all over these songs. Um, Max Martin back in the day, that was my jam, that’s what I grew up on. NSYNC and Backstreet Boys, I listened to a lot of that when I was writing. So you’ll hear big pop songs like that. What's your favorite song to perform live? MT: “No Excuses” because it’s easier than every other song I’ve written, and it’s actually a fun time. Which celebrity left you starstruck when you met them? Your fiance, Daryl Sabara, sings on your new album — what was it like working together professionally? MT: It was always fun, it didn’t feel like professional work. He was really good, he’s a good singer. Which celeb would you die to have sing at your wedding? MT: Oh lord, can they be dead or alive? I would die to have Frank Sinatra, even though can’t do that one. [To Daryl] Who should sing at our wedding, that won’t? MT: Oh, Bruno! Bruno, come sing for me! Sing at my wedding! I went to your concert, ya know, it’s like the same. What’s your favorite lyric out of all of your songs? MT: “We’re not promised tomorrow” in “Like I’m Gonna Lose You” — that song, them lyrics. If you could go back and give your teen self advice, what would you say? MT: I would say don’t stress so much, stop having so much stress. Like, relax, you’re a kid. You’re not an adult yet, adult life is much different. But also, time will heal all. And you look better when you get older, so don’t freak out, ya know? Check out Meghan Trainor's new single "No Excuses" here.